Mainstream media hysteria over Donald Trump’s election have promised nothing short of pogroms for anyone who isn’t white, Christian and male. And the group that they seem to think is most in danger is the LGBT community. “Donald Trump’s victory in the U.S. presidential election this week has left many lesbian, gay, bisexual and transgender (LGBT) advocates fearing a backlash against their community,” an NBC News article on the issue said. They then asked a group of people in the LGBT community — curiously excluding any lesbian, gay, bisexual or transgender conservatives, as if they somehow didn’t exist — to give similarly fear-inducing comments on the matter. “Donald Trump sits atop the most hateful Republican platform in history, one that sorely endangers the most fundamental American values of fairness and equality for all,” Sarah Kate Ellis, president and CEO of GLAAD, told NBC. Wow, it sounds like this is a bad guy. He certainly must have said some awful things about the gay community, right? Well, here’s what he said during his acceptance speech at the Republican National Convention in July of this year, just after an Islamic terror attack in a gay nightclub killed 49 people. “As president, I will do everything in my power to protect LGBTQ citizens from the violence and oppression of a hateful foreign ideology,” Trump told the crowd to thunderous applause. Mainstream media hysteria over Donald Trump’s election have promised nothing short of pogroms for anyone who isn’t white, Christian and male. And the group that they seem to think is most in danger is the LGBT community. Wow, it sounds like this is a bad guy. He certainly must have said some awful things about the gay community, right? Trump is Islamophobic for wanting to curb Islamic terrorism that targets those in the LGBT community. 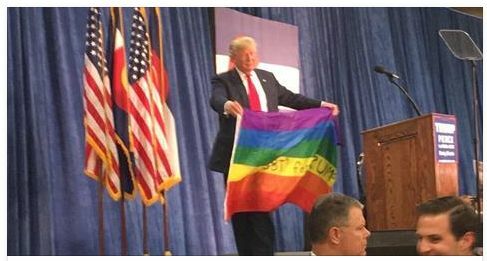 Meanwhile, he’s still the bigot against the LGBT community, because, like, Republicans just hate everything, you know? Radical Muslims don’t really like gay people. In fact, if you could do just one concrete thing to improve the lives of LGBT individuals across this vast planet, you likely couldn’t do better than fighting the exercise of Shariah law and Hudud by terrorist groups and/or governments. Of the many attributes ascribed to Hillary Clinton, the defender of LGBT citizens was certainly one of them. Yet, this is a woman who took money from Saudi Arabia through the Clinton Foundation, then armed them as secretary of state. You may have noticed that Saudi Arabia isn’t exactly Fire Island when it comes to gay tolerance. You may have additionally heard that it’s not a paradise for those who lack a y chromosome — another group of voters Hillary Clinton was supposed to represent — either. Clinton also helped craft the Obama administration’s ineffectual, hands-off policy to the savages in the Islamic State group during her time at Foggy Bottom, which was another cruel blow to LGBT individuals and women in the Islamic world as well. For all of the stories NBC News is going to run about liberal LGBT individuals or women who don’t feel safe because of Trump’s election, they’re going to stay perfectly silent about the lesbian, gay and transgender people who were brutally executed in Iraq and Syria, or the women murdered in unpunished “honor killings” in countries that were Clinton Foundation donors. Donald Trump is keeping LGBT individuals and women safe by making sure that hateful ideology isn’t given a backdoor into this country for reasons of political correctness. Please like and share on Facebook and Twitter if you agree.